A man who tried to stand up for a woman being harassed on the subway ended up getting knocked down by two women. A man who stood up for a woman being verbally abused on the Toronto subway ended up getting physically assaulted himself. Haris Masood, 24, was on his way to a friend's house Thursday evening for a relaxing long weekend. But after what happened, he hasn't been able to calm down. "I couldn't sleep the whole night," he said. "It's too much trauma. You can't get it out of your head." During shoulder-to-shoulder conditions during rush hour, Masood saw a woman carrying a baby yelling and cursing repeatedly at a young woman on the eastbound Bloor-Danforth subway train. He believes the anger was sparked when the two accidentally bumped into each other. When he stepped in and asked the woman to calm down, things got violent. "She threw her baby in a stroller. I thought she was going to yell at me, but she grabbed me by my shirt and punched me in my face," he said. "I was punched three or four times." Masood alleges the woman's friend then started punching him in the chest and kicking him. He describes both women as twice his size. "I couldn't think straight when I was being punched," he said. "I feared for my life at one point." The physical abuse then turned to verbal abuse. "She said, 'Go back to India,'" Masood recalls. "Then I heard something like 'terrorist.'" Masood, who came to Canada from Pakistan five years ago, said he was shocked to hear such hateful slurs in a place like Toronto. "We are full of tolerant people," he said. "We don't expect such behaviour." Witnesses jumped in to de-escalate the fight and one pulled the emergency alarm on the train. 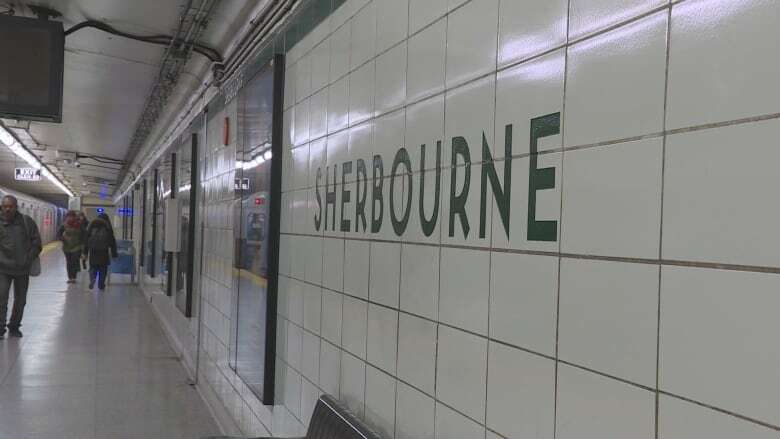 TTC officials arrived at Sherbourne station and waited with Masood and a handful of witnesses until police arrived. The suspects fled on foot. TTC spokesperson Stuart Green said surveillance footage of the incident has been handed over to Toronto police and they are now investigating. Masood expressed his gratitude for the witnesses who stayed at the station for hours to validate his story. "If one person abused me, there were ten people who stood up and said, 'Thank you for standing up for that woman' and 'You did the right thing.'" Though he's been left with a sore face, back and hand, Masood said he just had to do what was right. "I would step up ten times out of ten if I could protect someone."